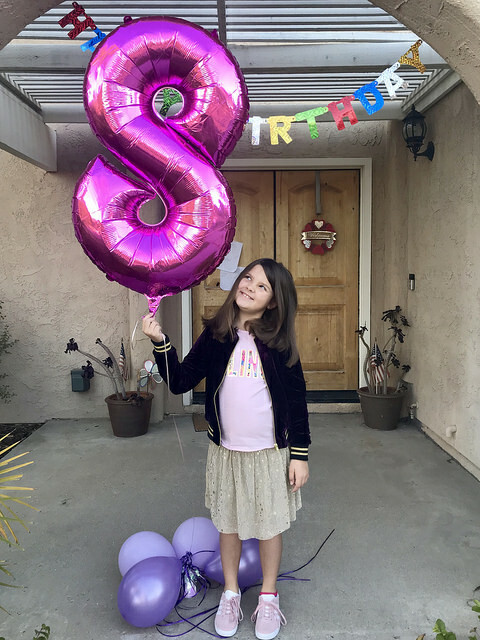 Annabel turned eight yesterday! She’s hilarious and creative, caring and loyal, and all around fantastic. Just like when she turned five, six, and seven, I’ve been writing down all the things she’s said will happen when she turns eight. She kills me! When I’m eight, I can go on more rides at Disneyland. I’ll be even taller when I’m eight – look out, Mom! When I’m eight, I’ll keep my room clean all the time…or at least, sometimes. I’ll have more friends when I’m eight, probably like a thousand or so. I’m going to have a garden and eat everything that I grow. Except for the flowers, duh. I’ll go to the snow and maybe learn to ski. I’m going to watch more TV when I’m eight. Like, what are those shows called that are about things? Documentaries. And also Disney channel. I’m going to redecorate my room when I’m eight. Probably with a Hamilton/Puppies/Softball theme, or maybe a science or American Girl theme? Gosh, I don’t know. I’ll dance every day when I’m eight. I want to take gymnastics classes when I’m eight. I want to get better at the splits and accomplish a high kick. When I’m eight, I will draw like, every day. I’m going to learn about the human body. When I’m eight, I’m going to be a popular girl. I’m going to get 100% on all of my math tests. I’m going to be a comedian. I want people to know me for my comedy. I’m going to memorize how to spell supercalifragilisticexpialidocious, and then I’ll spell it out loud and everyone will think I’m so smart. Oh, I’m going to go on an upside-down roller coaster! But my mom has to go with me and hold onto me so tight. I’m going to finish all the Percy Jackson books when I’m eight. I’m halfway through part one! I want to make sure everyone at my school treats the environment right so animals will live longer. When I’m eight I’m going to have the best year ever! Happiest of birthdays to my great eight-year-old! You are the light of our lives, and I love you with all of my heart. 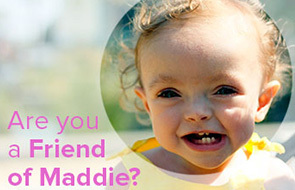 She is truly an inspiration for us all. Happy (late) birthday Annie! Keep being the coolest! Happy 8th Birthday, Annie! I hope you’re still celebrating! What a wonderful list of ideas and projects to accomplish this year. Have fun working on them. “Binky’s” 8. Wow. I remember you announcing she was here, and it doesn’t feel like it could be 8 years ago!!!! Happiest of Birthdays to Annie!! Binky! I forgot about the nickname! I think Ive been reading Heather’s blog for ten years now. Crazy! “I want people to know me for my comedy.” Girl, trust! You’re halfway through part one already! Wow, I’m pretty sure I started reading when she was 5. Happy Birthday!! Happiest birthday, Annie! And happy day to her whole family. I am so happy you were born. (And good choice on baseball teams!) You rock, Annie! Happy Birthday Annie! Being eight was the best! It’s been a joy watching you grow and become such an amazing little person. Good luck on crossing some of these off the list this year! You do have thousands of friends Annie! I remember reading the post when she was born and i was so happy for you guys then, seems like yesterday for me. Happy Birthday lovely girl! I love her plans! You should have her reflect on what she said last year! That would be cute to hear what she thinks about the things she did/didn’t do. I think I’m going to have to keep the idea for my own kids one day! “I want people to know me for my comedy” cracked me up! Great goals, Annie! Hope you had a happy birthday. Just started laughing when I read the upside down roller coaster part. Remember when you guys went on that slide and you made a video of it? ?. Annie’s Face. ??. Happy birthday to Annie!!! “Those shows that are about things” omg. If she likes ballet, there’s a great documentary called First Position about kids getting ready for a ballet competition.